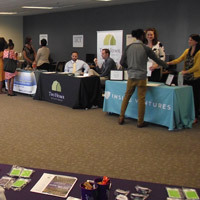 Webster connected 12 companies with more than 70 job-seekers in the Kansas City area. On Aug. 30, Webster University's Kansas City campus location hosted a job fair for students, recent alumni and the professional community that connected 12 employers with more than 70 job seekers. Featured employers included companies such as FedEx, Jackson County Court, Object Technology Solutions, Johnson County Clinical Trials and Unilever. Human resource and talent development professionals from the invited companies interviewed and networked with 73 job seekers, and came away impressed with the quality of candidates. Many were scheduled for more in-depth interviews at the employers’ location. The employers had an opportunity to learn more about Webster University and the academic programs offered in Kansas City and online. The day was an all-around success, with an immediate request to collaborate on another event before the year is over.